Why is Chapel Bridge important? First, it is probably the oldest wooden bridge in Switzerland dating back to the middle of the 14th century (first written record in 1367). Perhaps even more important, only very few covered wooden bridges do have old paintings under their roofs. The most famous two are in Lucerne: Chapel Bridge and Spreuer Bridge. Chapel Bridge and Water Tower mark the upper end of the medieval bridgehead city of Lucerne where the waters of Lake Lucerne flow into River Reuss. Originally Chapel Bridge and Water Tower were parts of the oldest medieval city ramparts of Lucerne. The northern bridgehead of Chapel Bridge once lead directly into St. Peter's Chapel. Today, a riverside promenade separates the two. Lucerne's Water Tower also served as a dungeon, an archive and a treasury vault until the 19th century. Today a traditional association uses it as a club room. Therefore the tower is not open to the public and cannot be seen from the inside. 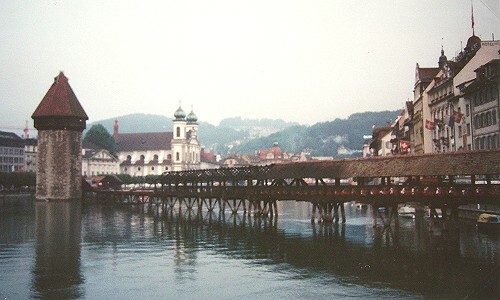 Originally Chapel Bridge had an extension leading from its northern bridgehead to Hofkirche, the oldest church of Lucerne associated to a Benedictine monastery. But this second part of the bridge was replaced by a lakeside avenue and promenade (Schweizerhofquai) in 1834. The fire broke out on August 18th after midnight. At 0:50 hours a tourist alarmed the fire brigade that a boat under the bridge and the bridge itself were burning. Detailed analysis showed later, that the fire broke out on the bridge itself (maybe due to a cigarette) and encroached upon the boat from there. Nevertheless, after the fire parking boats under the bridge was bannend. Due to the fact that Chapel Bridge consists of dry wood large parts of it were in full blaze when the fire brigade arrived within a few minutes. At 1:15 the fire was under control, but 11 more hours were needed to extinct the last hidden pockets of embers. For a photo showing the charred remains of the truss in the center section of the bridge (where the fire broke out) and a detailed sketch of the fire brigade's deployment of equipment see here (text is in German, translate: TLF = Tanklöschfahrzeug = triple combination pumper, Wasserwerfer = water cannon). 85 of the 110 pictures under the roof, dating back to 1611, were destroyed by the 1993 fire, only 25 could be saved or restored. The others have been replaced by pictures from the second part of the bridge that had been safely stored since 1834. A few burnt panels are still shown to remind of the fire. During the carnival season, the ancient pictures are replaced by modern ones showing carnival motives. This provides a platform for the creativity of today's population and besides the original pictures can be saved from thoughtless 'attacks' with all sorts of fun materials like paint and glibber bombs used during carnival these days. So if you're interested in the old paintings don't choose the carnival season for your visit to Lucerne.